GripGrab AquaRepel Arm and Leg Warmers are the latest addition to my cycling accessories. I wanted to have a set of warmers with aqua repellent properties. Castelli Nanoflex or Sportful No Rain warmers seemed an obvious choice, but my curiosity won and told me to opt for the GripGrab AquaRepel Arm and Leg Warmers. In this article I will share my thoughts and impressions on the design, finish and product features. I have skinny (upper) arms, so most arm warmers are to large and hang lose around my biceps/triceps. So it is always a challenge to find arm warmers with a good fit. 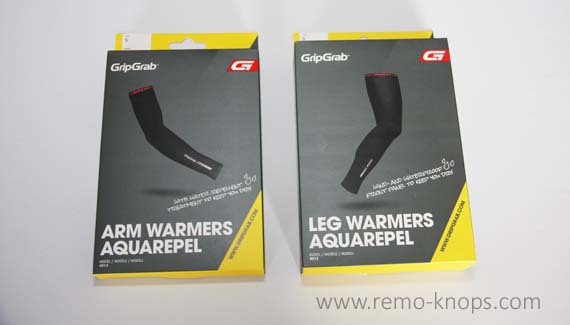 As mentioned in the introduction I didn’t opt for the Italian clothing brands, because the new line of AuqaRepel warmers from Danish company GripGrab caught my attention when doing the online research. The GripGrab AquaRepel Arm Warmers come a nice yellow box, and when you take out the arm warmers you can feel the quality of the product. The red silicone gripper gives it an exclusive look, and the GripGrab logos on the lower arm are reflective and help you with safety during late rides. When I opened one of the arm warmers to put on, I noticed a white R character on the inside. When I check the other arm warmer, there was an L on the same position. Normally you can notice left and right arm warmer from the logo’s , but in addition GripGrab has a clever design feature where they mark left and right on the inside of the warmer. In the picture you can see the R on the inside of the GripGrab arm warmer. Despite good design, fit and comfort are most important. The GripGrab AquaRepel arm warmers perfectly fitted my skinny arms and based on the sizing data on the website I’ve made the proper choice buying a size small. Furthermore there is just one low profile stitches on the inside that runs from the middle inside of your wrist along your elbow (so not over your elbow). So no rubbing or skin irritations when you have a long day in the saddle. My first test was a rainy 100 km ride on Belgian roads, where I wore the GripGrab AquaRepel arm warmers under a long jersey. They protect well from rain and wind, but after 4 tough hours of climbing you well get soaked wet anyway. That’s when the insulation becomes important. 🙂 All in all a good and positive test, during super wet conditions. 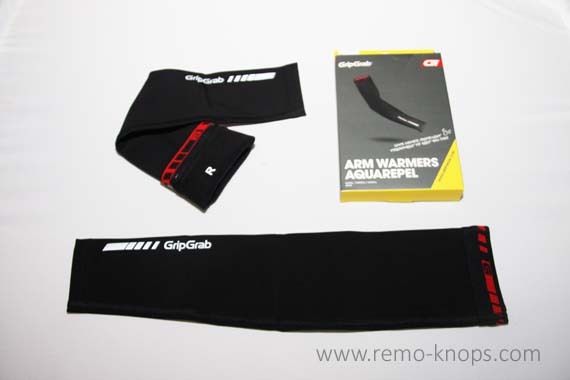 If you go for GripGrab AquaRepel Arm Warmers, it is a no-brainer to go for the GripGrab AquaRepel Leg Warmers as well. When I unpacked them from the yellow box I was even more impressed (the GripGrab AquaRepel Arm Warmers have a simple but straightforward design). The GripGrab AquaRepel Leg Warmers feature the same red silicone grippers on the upper part of the warmer, and you can find the left/right marking on the inside. The GripGrab logos are reflective as well. However on the bottom on the GripGrab AquaRepel Leg Warmer you have a second silicone gripper that keeps the warmer in place. The idea is to wear the GripGrab AquaRepel Leg Warmers over a waterproof overshoe to keep your feet dry. Since I’m still in the race for a pair of waterproof overshoes, I wasn’t able to test it yet. 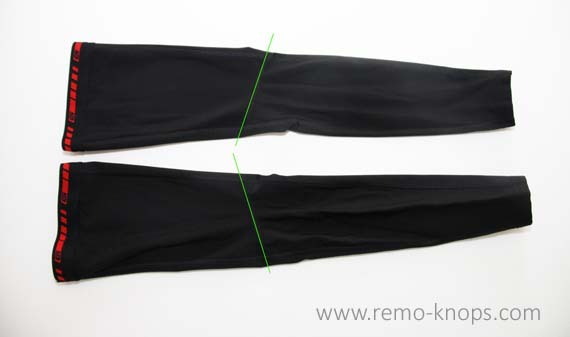 Another unique feature of the leg warmers is the front panels of soft-shell-like windproof material. It is thin but very stretchy, so you won’t feel any resistance or rubbing during your pedal stroke. I must admit this is a really nice feature, that I could test during the same rainy 4 hour ride. While you eventually end up being soaked, the windproof membrane and the insulation keeps you legs warm. Even in these wet conditions the GripGrab AquaRepel Leg Warmers were very comfortable to wear. When you look at the backside of the leg warmer, you can see that a stitch is running diagonal along the backside of your knee (see the green lines in the picture above). This increases ergonomic fit, but also more comfort during a ride. These are the clever design details of GripGrab that make the difference in quality. 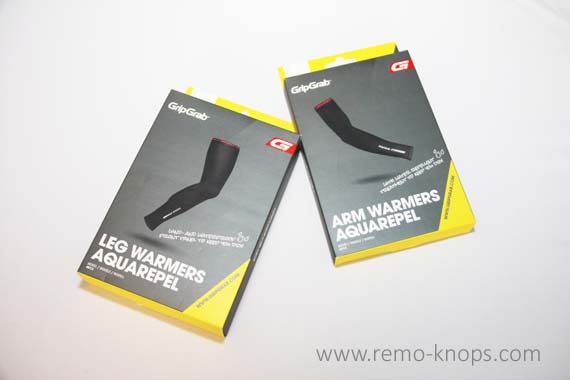 GripGrab AquaRepel Arm- and Leg Warmers are high quality products that can keep up with established Italian and Swiss brands like Castelli, Sportfull and Assos. The price-point of the GripGrab AquaRepel Arm- and Leg Warmers is around EUR 100,- for a set (you might find them a little cheaper). It’s a price I find reasonable given the comfortable fit, the high quality materials used and the well-thought-out design -from especially- the leg warmers. But I agree that this set of GripGrab AquaRepel warmers isn’t cheap, but in the same price range of comparable Castelli, Sportfull and Assos products. However I can recommend this set GripGrab AquaRepel warmers without blinking an eye. Finally the sizing data on the GripGrab website is very accurate and helped me ordering the best fit GripGrab Warmers. In addition I’ve also bought me a pair of GripGrab Classic Leg warmers for the dryer and a little warmer rides, which more or less underlines the trust I have in their products. What are the arm- and legwarmers you use ? Hey!, I found this information for you: "GripGrab AquaRepel Arm and Leg Warmers". 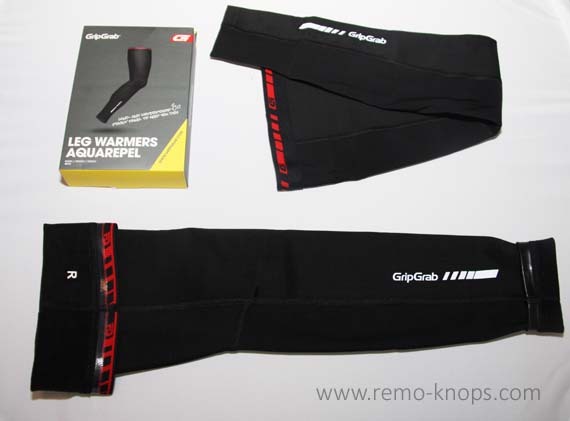 Here is the website link: https://www.remo-knops.com/6208/gripgrab-aquarepel-arm-leg-warmers/. Thank you.